Occasionally, Eve would weave personal vignettes into her articles and refer to her sister or parents. When I’d read these I would always feel a rush of excitement, as if anyone reading the article would naturally realize the family connection to know it was my mom or my grandparents she was talking about. It made me feel a little famous, by extension. I felt that same rush recently when I learned that one of the recipes from Five Star Food (one of the cookbooks published when Eve was the Sun’s food editor) had been featured on Oprah.com. Hey look everybody, that’s my aunt’s cookbook they’re talking about! Whoo hoo! 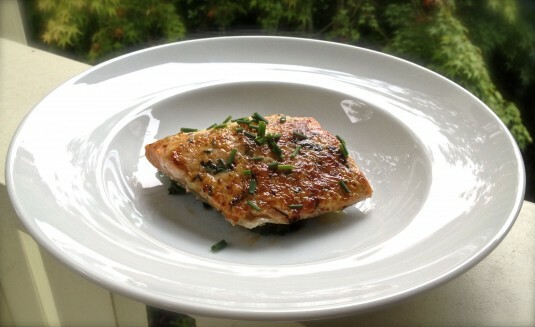 While I’ve had a copy of Five Star Food since it was published, I confess I had never made the Broiled Salmon Misonese until yesterday. Big mistake on my part. 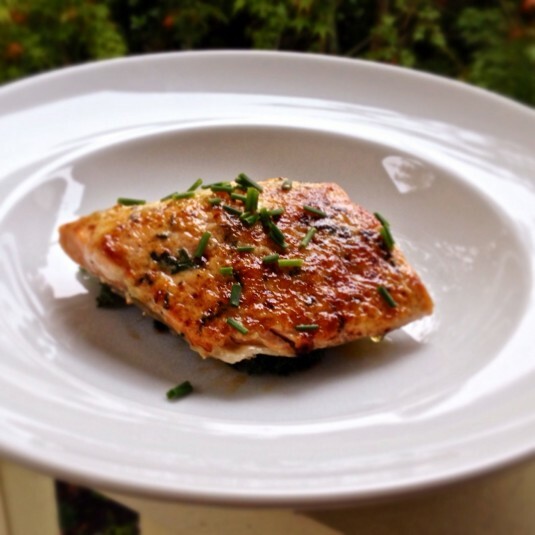 I think it’s the fastest salmon recipe I’ve ever made, and one of the tastiest. True to the Oprah.com mention, the salmon is delicious but deceptively simple: Less than 5 minutes to prep the ingredients (chop the chives, stir the miso and mayonnaise together) and, depending on the size of your salmon fillets, 6-7 minutes to cook. If you add a little more time to make a stir-fried veggie, like kale or bok choy, this is literally a 15 minute meal all-in. All in. It’s an excellent example of what I call real fast food: A healthy meal, made from scratch with real ingredients, that comes together quickly and delivers on flavor, big time. Ah Kris, how sweet to hear that you were excited by my modest fame. I love Five Star Food: Recipes to Delight Your Family and Amaze Your Friends . It was the first of the two Sun cookbooks I wrote, and it’s still my sentimental favorite because of what it says about the way people eat in this corner of the world, and how it came to be that way. I remember getting the first copy, and being dumbstruck by the sheer beauty of it: the cover, the layouts, the excellent line drawings by Michael Knox. I still enjoy thumbing through it, although I admit I make more meals from Six O’Clock Solutions: Fast and Easy Dinner for Family and Friends , the much more practical, 150 meals in 30 minutes or less cookbook that followed it. A big “thank you!” to O reader Su-Bin Kuah, for bringing Salmon Misonese to Oprah’s attention, and giving me a thrilling moment of fame by association. And deepest thanks to chef Shun Ohnishi, who improved all our lives by creating this recipe while working at the now departed Cannery Restaurant. When it comes to miso paste, a good rule of thumb is: the lighter the color, the milder the taste. The original recipe calls for barley miso, which surprised me, because every time I've made this recipe in the past 20 years, I've used shiro (rice) miso, for its lighter, less earthy taste. If barley miso is all that's available to you, choose one that's golden in color. Mix together mayonnaise and miso paste; set aside. 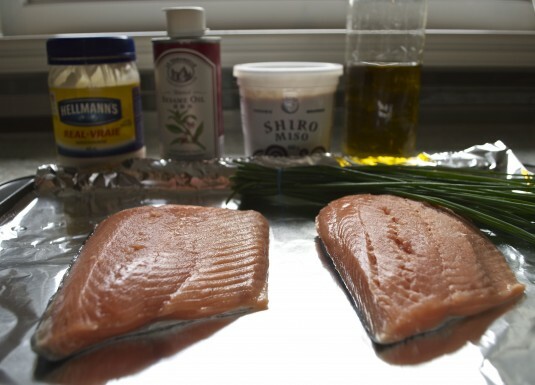 Combine olive oil, sesame oil, 1 tablespoon chives, salt and pepper; drizzle on top of salmon fillets and spread to cover evenly. Place fillets on broiler pan and broil until almost cooked (about 4 minutes). 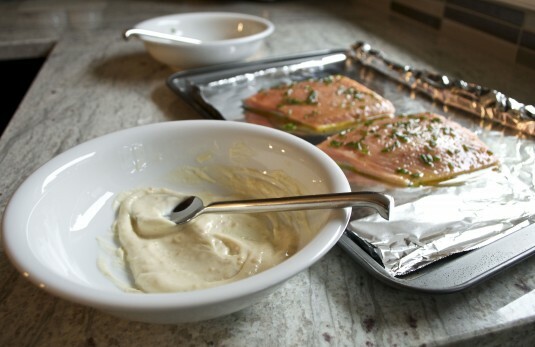 Spoon about 1 tablespoon mayonnaise mixture on top of each salmon fillet and broil for 1 1/2 minutes. Garnish with remaining 1 tablespoon chives and serve immediately. I remember reading her articles! Ooo, I love this recipe too and have been making it for years. It’s one of my favourites from that cookbook! Whisk together in a saucepan and cook for several minutes. This makes a sauce that we use on a pork chop and kale recipe we have. But it’s so delicious I think it would be good on just about anything! Probably really good on salmon, too. Mmmm…that does sound good, Daphne. And easy too — I’ll give it a try soon. Thanks! Eve was/is one of the finest culinary journalists this country of ours has ever seen! Love your blog! Oh, Anita, you are so nice. Thanks. Hope to see you on your next trip out here.